Dice, a career site for tech professionals, wanted to send relevant job postings to their subscribers based on their location. They used real-time geo-targeting to show job-seekers the latest available jobs near their current locations. The job postings displayed in the email also corresponded with areas of interest previously specified by subscribers. 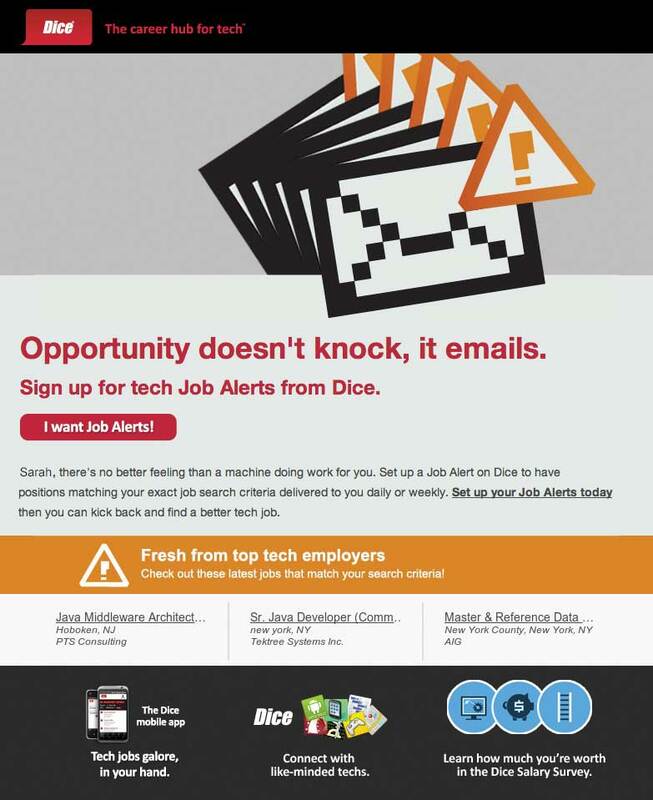 By creating an email campaign based on location, Dice created a highly-relevant and personalized experience that help their job seekers find the opportunities that were the best match for them. Location is often one of the top considerations job-seekers have in mind when exploring new opportunities. Targeting each email not only by recipients’ current geography, but also by self-declared areas of interest, transformed this campaign into a highly customized, 1-to-1 communication.